DISCO is the 2017 University of Sydney iGEM Team and consists of 8 students aided by 3 supervisors. Whilst most of us are in our 3rd year, studying a Bachelor of (Advanced) Science. We all have different majors, including biochemistry, statistics, molecular biology and applied mathematics. In addition to our love for the sciences, we also have students studying a second degree like economics or law… and even someone from the University of New South Wales! To find out more about us, click on our pictures to the left! Meet head of economics and self-described 'inspirational mascot' of our iGEM team, Alex! He's studying a Bachelor of Commerce/Science, majoring in Business Economics and Biotechnology. Alex does virtually everything - he's involved in outreach with industry and the scientific community, economic modelling, wiki editing, as well as spending time in the wet lab. 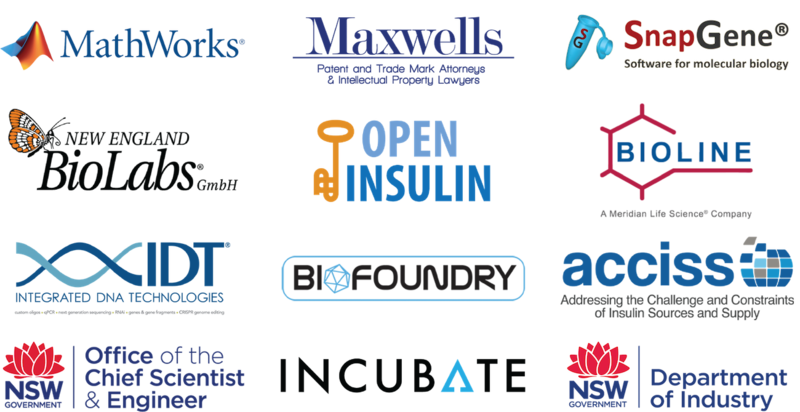 Much of his insulin expertise comes from his work with the biohacker group Biofoundry, which contains a node of the Open Insulin group. Alex's favourite piece of lab equipment is a finely tuned pipette - essential. His biggest science fail is accidentally autoclaving LB media in plastic flasks, which subsequently melted together. If Alex could be any microbe, he would be a tardigrade! Meet our head of human practices, Courtney! She's in her final year of a Bachelor of Science (Advanced), majoring in Statistics and Microbiology. As head of human practices, Courtney is in charge of outreach and spends a lot of time contacting politicians, industries, charities and community groups who work with diabetes and insulin . She's also done a lot of work coding the wiki and performing our economic modelling, and she also works in the wet lab. Courtney's favourite piece of lab equipment is the microscope. Outside of the lab, she likes Sudoku, watching TV, eating tubs of ice cream at once, and is a fan of Disney movies. If she could be any microbe, she would be Saccharomyces cerevisiae. Meet our team leader Emaleen! She's in her final year of a Bachelor of Science (Advanced), majoring in Microbiology and Biochemistry. As team leader, Emaleen has the massive role of overseeing all the activities of the entire team, both in and out of the lab. On top of that, Emaleen spends a lot of her time doing work in the wet lab. Emaleen's biggest science achievement is winning the University of Sydney second year Biochemistry pipetting competition. She now considers winning pipetting competitions a hobby. Not surprisingly, her favourite piece of lab equipment is the pipette. If Emaleen could be any microbe, she would be Staphylococcus aureus. Meet our head of team organisation, Erica! She's in her final year of a Bachelor of Science (Advanced), majoring in Immunobiology and Biochemistry. Erica is in charge of keeping our iGEM team on schedule and making sure that we meet all of our deadlines. She's also involved with human practices, liaisons with iGEM HQ, and does work in the wet lab with the rest of the team. Erica's favourite piece of lab equipment is the essential P200 pipette, and outside of the lab she likes op shopping, reading and snorkelling. She considers her biggest science fail to be accidentally setting a tub of ethanol-soaked paper on fire. If she could be any microbe, Erica would be Vibrio fischeri. Meet our head of team collaboration, Grace! She's in her final year of a Bachelor of Science (Advanced), majoring in Molecular Biology & Genetics and Immunobiology. Grace organises our collaborations with other iGEM teams, and oversees all of the team's social media accounts. She also works in the wet lab alongside the rest of the team. Grace's favourite piece of lab equipment is the Nanodrop Spectrophotometer. She considers her biggest science fail to be accidentally spilling a culture waste bottle full of E. coli. Outside of the lab Grace likes reading, learning languages, and butterflies. If she could be any microbe, she would be a Fusobacterium. Meet our Lab Guru, Jamie! He's in his third year of a Bachelor of Medical Science, majoring in Molecular Biology & Genetics and Immunobiology. As the head of our laboratory activities, Jamie has the huge job of coordinating our whole team's work in the lab, and has an in depth knowledge of all the techniques we have been using. He spends most of his time in the wet lab himself - there's no time for hobbies when there are bacteria to transform. His favourite piece of lab equipment is the pipette 'boiii', and his biggest science fail arises every time he encounters calculations. If Jamie could be any microbe, he would be Wolbachia so he could fight off viruses with genetics. Meet our head of modelling and wiki expert Ruby! She's in her final year of a Bachelor of Science (Advanced Mathematics), majoring in Applied Mathematics and Biochemistry. Ruby is in charge of our mathematical modelling and oversees the wiki, on top of doing wet lab work with the rest of the team. Ruby's favourite piece of lab equipment is anything but centrifuges, which she has an irrational and debilitating fear of. Outside of the lab, she enjoys roller derby and video games. If she could be any microbe, she would be a trypanosome - they have a two-step verification of their mitochondrial genome, which is so cool! Meet our head of design, Steph! She's in her third year of a Bachelor of Science (Advanced)/Bachelor of Law. Steph is in charge of everything design - from our logo, to our wiki, to our posters and our presentations. As our resident legal expert she's been learning all about Australian and international patent law, and she also works in the wet lab. Steph's favourite piece of lab equipment is the fidget spinner centrifuge. She spends a lot of her time outside the lab being locked out of the lab after losing her ID. Inside the lab, she considers her biggest science fail to be trying to do 80 mini-preps at once. If Steph could be any microbe, she would be a 'Stephylococcus'. Meet our primary academic supervisor, Nick! Nick studied a Bachelor of Science (Honours) and a PhD in Microbiology at the University of Sydney, and he's been supervising the University of Sydney iGEM team since 2013. Nick gave us the space to work in his lab, and spent many hours designing, advising and troubleshooting countless experiments. Nick considers his best science achievement to be the isolation and characterisation of the Polaromonas strain JS666 which can grow on cis-dichloroethane. If Nick could be any microbe, he would be a Saccharomyces cerevisiae as it can make its own beer. After all the work he's done for us, he certainly deserves a drink. Ed Hancock is the mathematical modelling god. To find out more, go to our attributions page!